I’m going to cut and paste my comment under the Buying/Selling article but have a few additional comments since you just posted your article. “I honestly can’t tell about the accuracy of some prices online, I don’t know if there have been a couple of buyouts or people are pimping out decks for GP Charlotte or what’s going on. A few months ago I started picking up foil Snapcasters for $100 and foil Caverns of Souls for $40ish and now they look to be $250 and $100 respectively. 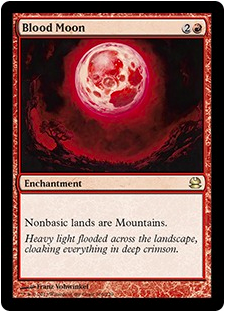 (I’m disgusted with myself for not buying MM foil Blood Moons for $30 a year ago but all non-foil Moons are roughly $50+?!?!?.) Does anyone know what’s going on with these prices? Is it just that they weren’t reprinted in MM 2015, buyout, GP Charlotte prep??? For foil Snapcaster to jump from $125-140 to $250 in maybe 2 weeks seems insane although I’m quite happy if this is truly his new price point. So it looks like your advice about foil Snaps is already too late unless I’m looking at the wrong sites. 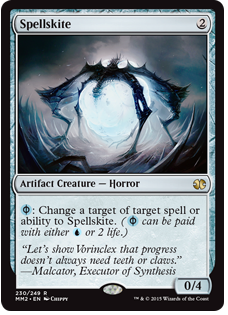 I’m SHOCKED by Spellskite as well but at the same time it really is an EXTREMELY versatile card, it even just won Ali Antrazi the match vs. CVM at the invitational. And I have to jump on my soap box for a moment, Dealers/Vendors like Aether Games (and I’m going to blast Madlem too when he posts) have prevented the price of Goyf from dropping further. People talk about SCG causing inflated prices at times but they aren’t the only ones. There’s no reason Aether Games HAD to offer $130 for new Goyfs. I’m not a store or vendor, but I don’t understand the importance of paying more just to have a card but making less profit. Buying Goyf at $100 and selling for $130-140 yields the same or more profit than Goyf at $130 and selling for $150-160…unless Aether Games is continuing to buy and not list them for less than $200. It’s just extremely disappointing that a few people/dealers have artificially kept the price of Goyf a good $50 more than it could be and $100 more than it should be, but I guess that’s life. It still doesn’t make much business sense to me…a card is reprinted and you offer MORE to buy it than before it was reprinted!?!?! Ok, back to you and your opinion, last huge modern GP hosted by Star City really spiked a ton of prices of cards like Blood Moon and Goblin Guide and many others…with GP Charlotte this weekend will MM 2015 cards hit their high point and then drop, climb and stay there, or not be affected?? Or will it depend on performance? 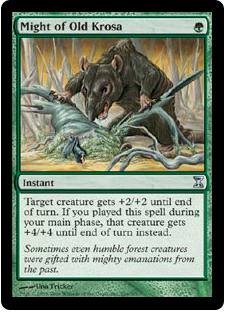 Just wondering if now if the time to buy a playset of Splinter Twin or when that time would be. Thanks man, thanks for your card analysis in your article. Incorrect. If you offer the highest buylist prices and thus get all the Goyfs, you’ll come out ahead even if you sell them for a lesser margin. David I guess you are right but it still seems like a bit of a publicity stunt at the cost of players in need of Goyf(s). Plus, after buying at $130 Aether Games has to compete with the prices of other vendors who can sell for less than them to make a profit. Goyf is only $145 on ebay, that’s a tough price to compete with in the short term. I admittedly don’t understand the vendors perspective of buying cards…vendors go to events and GPs to buy cards!! I would think they would want to sell cards they can’t move at their home store (if they have a brick and mortar store) and only buy stuff they can fairly easily flip for a profit. So there must be something to offering the highest buylist price and having people flock to your table to sell Goyfs and other cards but I personally don’t quite understand how it helps the bottom dollar. Foil Snapcaster / Cavern of Souls – These are price corrections due to the influx of new Modern demand from Modern Masters 2015. These cards have been poised to go up for a while. Foil Tasigurs / Mentors – Great, glad you’ve been able to snag better deals! For me, I mainly buy through TCGPlayer since my local card stores are always SCG prices or higher than TCGPlayer mid. 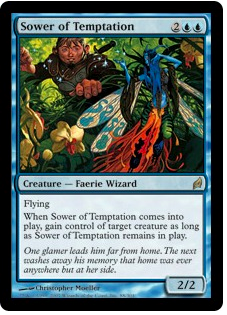 Gurmag Angler foils are also nice to pick up as specs, however I think Tasigur is just so much better than Angler. Honestly, I’m with you on the Aether Games price offer for ‘Goyf but think about it… If they didn’t offer that type of price, they would have easily been sideswiped by other huge vendors onsite and wouldn’t have been able to get any ‘Goyfs for themselves. It was only a matter of time before someone did it. Like GP Richmond after MM2013, GP Charlotte will have price spikes on site and then bottom out as the end of the year approaches. Many cards still have a good chance of continuing their price decent, especially casual cards like Creakwood Liege. 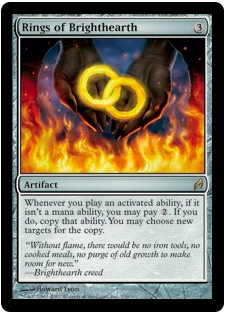 If you’re looking to pickup Splinter Twin, I would wait until next month and the market becomes saturated. 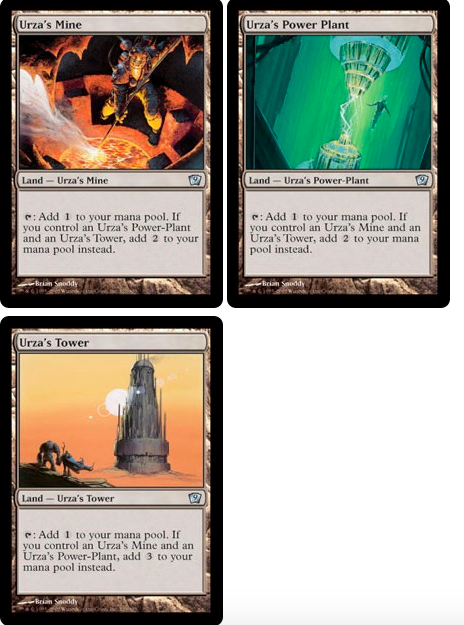 Why has the buyout only made 9th edition Urza’s mine spike? Is that the only thing that someone bought out? 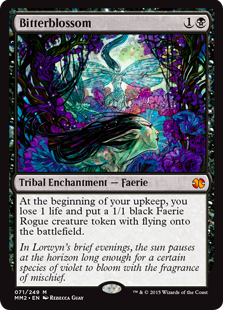 Are the filter lands only propped up because of their scarcity? 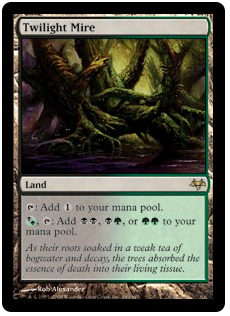 How hard would you speculate they would drop when reprinted? Any idea what’s with the oblivion stone spike? O-Stone spiked on GR Tron winning the Invitational. The buyout on 9th is because there was simply a scarcity of that printing online. Filters have solid, all-around deman,d and they’re old. They’re $6-8 cards if reprinted. Agree with your comments, Corbin. Goyf staying that high is helping to spur the popular Grixis decks in Modern, especially for newcomers with the Delver version. 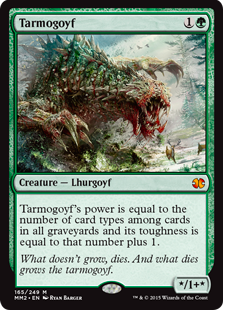 You COULD buy a playset of Goyf and run Jund/Junk, or you could run the much cheaper Tasigur who’s doing a fine imitation so far. I’m just glad to see UBR a thing again. Yes, I agree with this line of thinking. I believe Wizards created Tasigur as a “pseudo” ‘Goyf that allows non-green decks to still have a cheap 1-2 mana clock. The only issue with Tasigur is that he is legendary, and requires Delving to play cheaply. 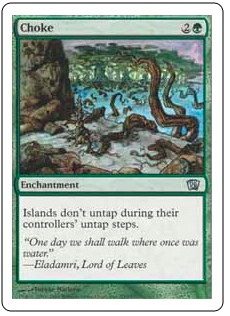 Unlike ‘Goyf though he presents inevitability to your opponent by being able to recur cards from your graveyard. Good points about the cards that were not reprinted. Engineered Explosives and Omniscience were in high demand among the binder traders at Chiba as well. 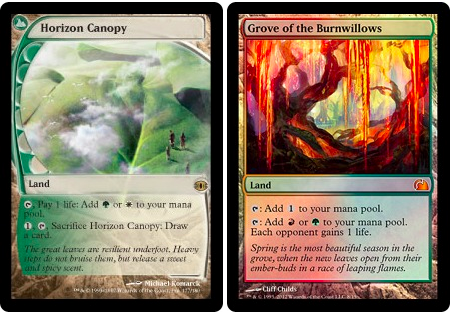 im sitting on a few hundred tron lands from antiquities and chronicles, just waiting for the water to flow downhill and flooded these prices… is the 9th tron demand because of the fact that that art is the only available foil? But what about 8th? is that technically not legal in Modern? The 9th ed spiking is merely a flash in the pan. The price is going to come down, but will still be above what it was previous to the spike. 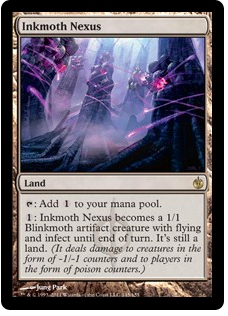 I expect older versions of Tron lands to be higher priced in the long run due to scarcity and the “cool” factor. Should we all just accept that prices are what they are… And they are that way because WE say they are, collectively speaking? 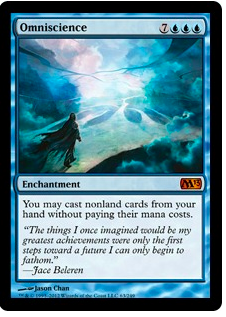 Maybe MM15 was never about making cards cheaper or making the format “more accessible”. Maybe it was just about making sure there is a release valve for when there is too much pressure… Maybe MM reprints are about keeping the Overall price-point exactly the same as new players do, indeed, enter the format. That’s certainly what it’s feeling like after seeing two of these sets released. 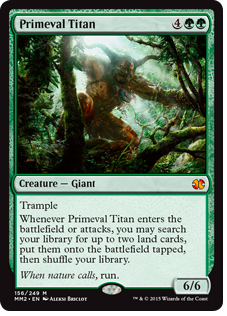 However, I think the bigger goal that Wizards wants is for casual cards to go down in price – ones that newer players want to pick up for Commander decks like Stonehewer Giant, Figure of Destiny, Grand Arbiter Augustin IV, etc. As long as the casual crowd is appeased, everything is ok – remember, most of the $$$ from this game comes from players who buy single booster packs once every two weeks at their LGS and sling unsleeved cardboard on their kitchen table. Thanks for your response Jared. FYI the best deals I find are typically on ebay. Sometimes you have to get a little lucky but there’s auctions that just fall through the cracks and foil Playsets that are “cheap” cause people only need one of a foil so buying 4 of a card leads to a discount. Like I was trying to get foil playsets of Ugin for $250 and gave up…well one of the auctions for foil playsets sold at $215 so someone who didn’t give up got a phenomenal deal. With Dragonlords and Raptors and Den Protectors the hot cards along with MM2015 release Fate foils really fell in price, or at least discounted via ebay auction. Not sure if that is still the case but check it out for foil mentors and taz. 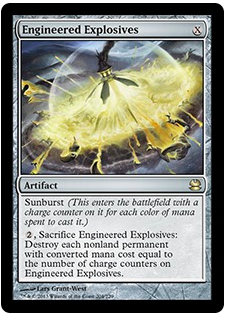 And foil Gurmag Angler seems a little pricey to jump in on at this point as a spec. But he’s gone from $3-4 roughly 6 weeks ago to $10-14 so congrats to whomever got theirs already. 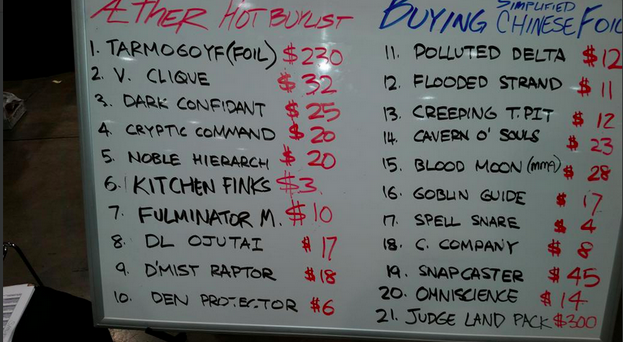 Actually one more question, why is foil Delver only $15 (or less)?? It’s been this price for over a year. It’s one of the most played cards in all of magic and is a great/viable archetype in all 3 eternal formats…how has this price not moved? Thanks bud, look forward to more great work from you. And again thanks for your detailed response. Take care! Well, foil Delver was only $5 for the longest time if you can believe that! $15 was the next point for it to jump up to, and I can only see it going up from there until the next (foil) reprint. Thanks Jared for writing this article for everyone to see. The comments have been great as well. Free articles like this keep the site bookmarked. 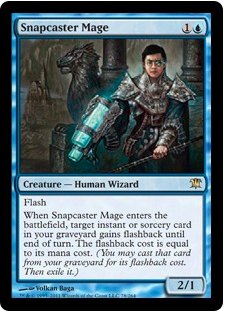 Speaking about Snapcaster Mage, when do you think it will be wiser to unload such card? I mean, to what extent do you think its price has a growth potential? If you want to unload one, then this weekend will be the best time possible. Prices are going to spike based on Modern demand, then slowly trickle back down over the weeks.